Sewage pumps are used to transport solids up to 2 inches in diameter through pump systems. These pumps are perhaps most commonly used to transport waste from bathrooms to a sewer or septic tank. Models may include a float switch and/or cord, check specific product listings for details. 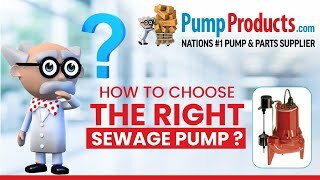 PumpProducts.com carries sewage pumps from top manufacturers such as Goulds, Zoeller, Myers and Little Giant at some of the best prices on the web.